The Inglewood and surrounding communities WILL be getting a supermarket complex – which is good news – but the cost will be driving past or, for those living behind the complex, looking at two tilt-up concrete walls (see image). We do not accept that a concrete tilt up panel building is in keeping with the character of the Heritage Protection Area of Inglewood or fits into the existing streetscape ON ALL FOUR SIDES – meaning, if you live behind the development or as you drive down Beaufort St heading towards Morley all you will see is concrete panels. Woolworths argued their architectural form was ‘art deco’. Nevertheless, the City’s Design Review Panel accepted the design as art deco and so did today’s the Development Assessment Panel. Our second point of concern was the fundamentally flawed pedestrian amenity on Eighth Avenue. Asking pedestrians to cross 20m+ of crossovers including a 6.5m wide carpark entry/exit, a 14.5m wide loading bay and a six-metre wide Inglewood Lane all next to each other is a recipe for disaster. We pointed this out to the Development Assessment Panel that up to 9 vehicles or trucks could be coming every which way at pedestrians but our concerns were rejected. 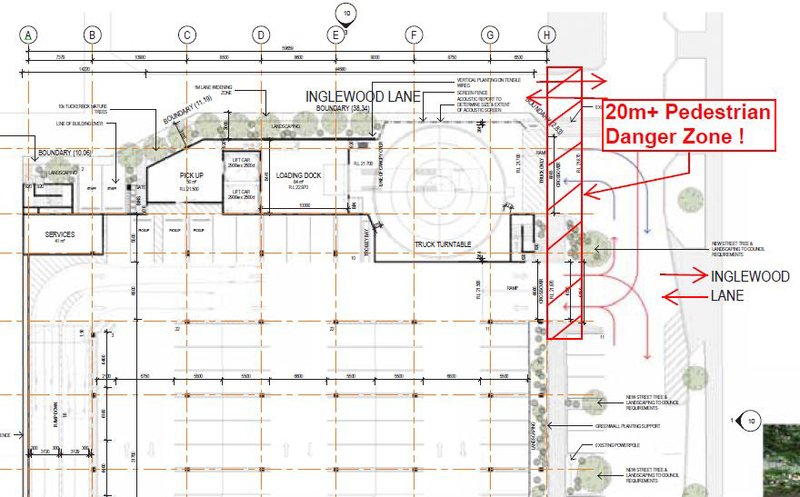 The Society argued for the loading bay and the car park entry and exit to occur off Inglewood Lane as required under the Beaufort Street Local Development Plan but this was not accepted despite it having been required of the Second Avenue IGA. The suburb of Menora featured on 6PR's Saturday morning radio on 16 March 2019. Our Society was asked to provide some history on the suburb and our President, Paul Collins, did a fantastic job of enlightening the Perth listeners about this wonderful suburb. Paul talked about the wonderful house at 19 Alexander Drive, built by the Breckler family (of shoe retailers Betts & Betts and Cecil Bros). See photos below of home prior at various times over the years. He also talked about the fabulous Battle of Learoyd Street in the '30s - between the City Council and the Perth Road Board - over 'the smellful atrocity hampering the extension of settlement' (otherwise known as the the sewerage night carts! The full interview is only 12 minutes and extremely interesting. Because of Mount Lawley Society’s large and ever-growing archive, it was an ideal opportunity for us to delve in and see how we could be a part of this exciting community exercise as well as provide a legacy for some well-known or important people from our past. Led by Deb Olle, our Archiving Sub-committee put together a rationale for six Mount Lawley residents to be recognised as worthy. There were 251 names submitted overall, which shows the huge interest by the local community in being involved in building the identity of our suburb. After much consultation with various groups, the City of Vincent has now released the names chosen as suitable and three of the names that we submitted are on that list: Arnold Lane, Danker Lane and Merifield Lane. Arnold Lane: runs parallel and between Raglan Rd and Grosvenor Rd (Beaufort Street end) – in recognition of Arnold’s Pharmacy and the Arnold family’s longstanding links to the area and local community. Arnold’s Pharmacy was a historic Mount Lawley business, established in the Alexander (previously Broadway) Building at 645 Beaufort Street in 1910. Arnold’s was the first pharmacy in Mount Lawley and was named after the proprietor, Mr Albert Edward Arnold, and then his son Mr Maxwell Arnold who operated the pharmacy until the 1980s. Danker Lane: runs from Grosvenor Rd to Chelmsford Rd (alongside No 36 Grosvenor and No 21 Chelmsford Rd) in recognition of Eric Leslie Salisbury Danker’s, service to the country and the Danker family’s long-standing links to the area and local community. Eric Danker enlisted from his parent’s home at 32 Grosvenor Road Mount Lawley in May 1915 at the age of 22. He served in the Australian Army Medical Corps, 2nd Field Ambulance in France, rising to the rank of Staff Sergeant before he was killed in action on 17 April 1918 at the age of 25. Merifield Lane: runs parallel and between Chelmsford Rd and Vincent St (Beaufort St end) in recognition of William Merifield’s service to the country and the Merifield family’s long-standing links to the area and local community. William Merifield enlisted from his parent’s home at 19 Grosvenor Road Mount Lawley in June 1915 at the age of 19. He served as a private in the 28th Battalion of Infantry of the Australian Imperial Force. In 1918 he was wounded but recovered from his injuries and returned to live in Mount Lawley in 1919. We are now endeavouring to track down family members of these men and make them aware of this significance. If anyone has information please contact the MLS. Please click on the names to read the full submissions by the Society for Arnold’s Pharmacy, Eric Danker and William Merifield. Thirty community groups joined forces to voice concerns at the Plan For Community Stop The Rot rally at Parliament House on 7 November 2018. There were 13 different speakers representing the 30 community groups, each with their own individual issues. Mount Lawley Society President, Paul Collins spoke about the Society's concerns about Development Assessment Panel decisions which have caused five significant heritage dwellings to be lost since 2016. "Planning decisions on our side residential streets should not be made by DAPs. Leave our side residential streets to the people who know their community - that is our elected local council members", he said. No 26 Wood Street, Inglewood is a three-storey block of flats built in the late 1960s – like a lot of blocks of flats built in the 1960s and 1970s in Perth’s inner suburbs as part of the implementation of the Stephenson and Hepburn Plan. At the time, these developments destroyed hundreds of heritage homes in Inglewood, Menora and Mount Lawley BUT the only saving grace was the mandatory setbacks and large land area they required for significant landscaping that today provides a wonderful green oasis as can be seen from the aerial photo. 26 Wood St, Inglewood is now controlled by a single developer who is seeking to re-zone the site to a higher density to allow development of the landscaped land surrounding the existing three-storey block of flats. The developer lodged the same re-zoning application before Council last year but was knocked back. Numbers on Council have since changed and the developer is having another go. Neighbours have reported at least TEN large trees have already been chopped down as the photos show. This three-storey block of flats comprise 23 units and the developer wants to increase the zoning to build on the surrounding land. If the developer is successful then this will set a very dangerous precedent that will put at risk a significant amount of valuable green space in Perth. The City of Stirling advise more than 40 blocks of flats in the Heritage Protection Area of Inglewood, Menora and Mount Lawley at risk of similar applications for higher zoning. Decision to initiate this re-zoning rests with the Council of the City of Stirling on Tuesday 18 September at 7.00pm. Please come along and take part in question time to stop this application for higher re-zoning. If you are unable to attend then please call or email all City of Stirling Councillors NOW and express your views. Contact details: stirling.wa.gov.au/ Council / Mayor Wards and Councillors OR download, print and sign this petition, scan and email to Mount Lawley Society by Tuesday 4.00pm so that the petition can be presented at the Council meeting. Perth’s future film industry is secure if the quality of films in the Society’s recent Mt Lawley Short Film Festival is anything to go by. 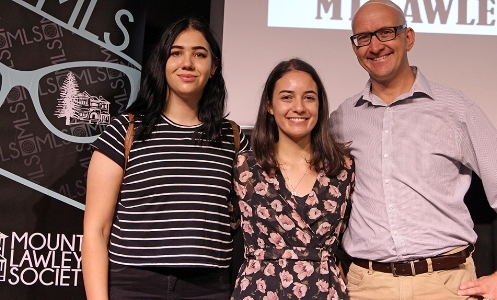 Some of Perth’s emerging film makers showed their outstanding skills and talents recently at the Film Festival held at the Astor Lounge in Mt Lawley. This is the second festival to be run by the Mount Lawley Society. With the Astor Lounge near capacity, the audience was entertained by historical footage of Perth in the 1950s, the Commonwealth Games in 1962 and some amazing historical film of Perth as well as seeing the outstanding finalists’ entries. The winner of the Open Category and $1,000 was Roger Elmitt who produced McPherson Street, a short history of a street in Menora. In accepting the prize, Roger said “this film, based on my book of the same name, was very much put together with enjoyment and collaboration – both near and far. My brother in England, Ray, was the film maker, I wrote the screenplay, my daughter’s partner, Scott, was in charge of sound and the wonderful Molly Worsnop – who has devoted her whole life to Perth theatre – was the perfect narrator”. Student category winner of the $750 prize was awarded to ECU student, Corina Stagg, who went with one of the themes for this year, ‘Mt Lawley,’ with her film, Heart in Hardware. Her film highlighted the history of the Mt Lawley Hardware Store in Beaufort Street. 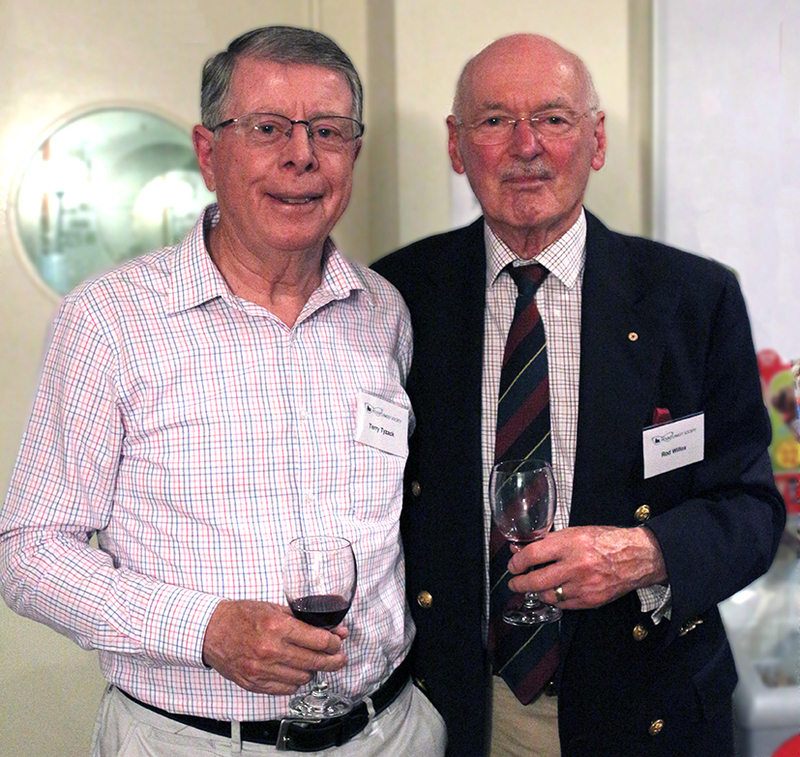 It was a pleasure to see two Life Memberships awarded to two very special men at our Society's AGM, held on 4 December. Former City of Stirling Councillors, Mr Terry Tyzack and Mr Rod Willox were each given Life Membership of the Mount Lawley Society for "outstanding service to the Community and the Mount Lawley Society as Councillors in the promotion, protection and understanding of the very special heritage characteristics of Inglewood, Menora and Mount Lawley". Rod as Councillor for the Lawley Ward since 1993 and Terry as Councillor for the Lawley and Inglewood Wards since 1974. After listening to the various reports, it shows that the past year has been a very busy one for the Society, with some wonderful highlights such as our 40th Anniversary. We farewelled four Committee Members: Treasurer Bruce Wooldridge and Committee members; John Wreford, Andy Ross and Phillipa Baines. Thank you to these wonderful and hardworking members. We welcomed three new Committee members in Terry Tyzack, Tracey King and Jan Wilkie as well as Committee members who have re-nominated: Paul Collins (President), Mark Hodge (Vice-president), Sheila Robinson (Secretary), Pina Caffarelli (Treasurer), Christina Gustavson, Rita Tognini, Peter Conole and Patron, Barrie Baker. This morning, WA's Minister for Planning, Rita Saffioti, was questioned by ABC Presenter, Geoff Hutchison on the DAP Issue. Please listen to the audio of Ms Saffioti as well as the reply from Mount Lawley Society President, Paul Collins. Apologies for the audio quality as well as missing the first part of Paul Collins' reply. Mr Tim Hammond, MHR for Perth, rose in Federal Parliament on 11 May 2017 to provide a congratulatory message to the Mount Lawley Society for our 40th Anniversary year in 2017, as well as acknowledging the continued hard work our Patron, Barrie Baker, has done during his 38 year membership of the Society. The Society thanks you, Tim, for your ongoing support. If we thought that 2017 was going to be less hectic, we were in for a bit of a shock. There have been concerns recently in our area about the Guildford Road widening, and what that might involve, as well as the reportingof the closure of the Mount Lawley and the Meltham Street train stations. Our members and visitors to our site might be interested in the comments and letters, to those who might be affected, by our local State Member for Mount Lawley, Mr Michael Sutherland. “How will we know it’s us without our past? Despite a Heritage Protection Area within the City of Stirling’s Planning Scheme requiring the retention of such buildings and a strong campaign from the Mount Lawley Society, all power was lost when the State Government’s undemocratic Development Assessment Panel (DAP) took over and sanctioned its removal on 15 October 2015 and 15 December 2016. The ample land at the rear was not enough room for development—it required the removal of the whole building. It didn’t take long for the developer to move in with demolition starting late January and completed this month and for what? The developer is looking for pre-sales but what if they’re not achieved, the community is left with a vacant lot? The Mount Lawley/Inglewood community is pretty savvy and pre-sales are not a foregone conclusion. If developers don’t bring the local community along with them then their project is at risk of failing. Heritage buildings were demolished on the corner of Burt St and Walcott St more than a year ago and pre-sales are still being sought. Meanwhile the community lives with the loss of heritage buildings and a now vacant site. Another example was the ugly, over-height, over-bulked and under-parked DAP approved development on the Inglewood IGA site in Beaufort St. Such overzealous development sanctioned by DAP was never going to work with the Inglewood community. It just wanted its IGA back. A smart developer would look at incorporating existing heritage buildings into a new development and take the local Mount Lawley/Inglewood community with them but where are the smart developers? Clearly, they’re not required whilst DAPs are around. So, after a tally of five heritage buildings lost in the Heritage Protection Areas of the City of Stirling in 2016 due to DAPs, we have our first for 2017. Development Assessment Panels are our biggest threat to heritage and your Committee is working hard to ensure a scrapping of the Panels or a significant policy change from our major parties before this election. We met face to face with the WA Opposition Planning Minister, Ms Rita Saffioti, and the new Planning Minister Hon Donna Faragher MLC. However, neither major party has yet offered a policy to abolish or reform DAPs. To our knowledge, the only political party promising to ‘Scrap the DAP’ is the Julie Matheson Party. This party is contesting the Upper House with Julie Matheson contesting the North Metropolitan Region and Russell Goodrick contesting the East Metropolitan Region. WA DAY WEEKEND - JUST ANOTHER DAY TO REMOVE ANOTHER PIECE OF HISTORY ?? This was a disgusting but excellent exercise in how developers finally get their way and achieve a complete demolition. Even though the current day look of 760 Beaufort street was not pretty or even remotely looking like a heritage building, underneath that cream and red paint were the original walls of the Pole's Store dating back to 1912. The new development CLEARLY required the retention of the facade. But, it appears, that by gutting the inner walls of the building the external walls have now become unsafe and the OK has been given to demolish the facade. From the moment any plans are passed, Councils must ensure that developers be made to ensure the safety and stability of the saved facades of historic buildings. Daniel Heymans (Coordinator City Planning Projects) and Fraser Henderson (Manager of Planning) from City of Stirling addressed the meeting with the City’s findings and proposed outcomes from the Scheme amendment advertised in early 2015. Pleasingly, most of the points submitted by the MLS were taken on board and most of them have been incorporated into the report to go to the full Council in April, including height restrictions, removal of mandatory nil setbacks, increased rear row setbacks, re-instating visitor parking and no longer proceeding with a narrowing of the Main Road Reservation. Unfortunately, our submission to retain the Character Retention Guidelines for demolition of pre-1960 dwellings on Beaufort St was not accepted. The City would prefer to list buildings and facades for protection in an Appendix. A copy of the presentation is available for our members to view clicking on the Beaufort Street Activity Corridor image on this page. Presenters were thanked for attendance on a public holiday. "One of the fundamental principles associated with integrating heritage-rich buildings with new ones is to consider the space around the old building. If you can't provide any breathing space then at least plan a development which allows the old girl some dignity." "People experience places in the urban environment at street level and it is at this level where things go so wrong ... standing at the footpath and looking up at the junction between these two buildings, what I see and feel is one big bully boy belittling the other in a monstrous way." These comments are by Linley Lutton, University of Western Australia planning lecturer and owner of a Perth urban design firm. "IN A MOVE THAT COULD PAVE THE WAY FOR SIMILAR CHANGES ACROSS PERTH, THE CITY OF STIRLING WANTS ITS APPROVALS PROCESS TO REQUIRE DEVELOPERS TO PROTECT SIGNIFICANT TREES"
This, and more, in the article in The West Australian on Thursday 10 March 2016, talks of the catastrophic problem that "290ha of tree canopy would be lost to infill housing by 2030 under a 'business as usual' approach". Interestingly, as you can see in the attached article in the paper in 1983, it highlights the Mount Lawley Society's ongoing stance of "OUR STREET TREES ... AND THEIR FUTURE". Read more in both articles alongside this story. Let's make this the last weatherboard heritage property to go down into the dust !! The demolition of this weatherboard house in a heritage area has already been endorsed by the Planning and Development Committee of the City of Stirling. It now comes before the full council tonight (16 February 2016). This property, at 177 Seventh Avenue Inglewood, is one of fewer than 16 weatherboard/fibro dwellings in Mount Lawley/Inglewood built early on in the development of these suburbs. AT LEAST SIX HAVE BEEN DEMOLISHED ALREADY. Is a weatherboard house in these areas an anachronism in 2016, basically too primitive to be retained or modernised ? This may well be an overwhelmingly common belief, so that these properties are prime opportunities for developers to acquire, neglect and then demolish. But these rare properties do have a value in our community, for they point back to the very earliest days of our city in those suburbs. They clearly belong to the heritage of our city. One might be surprised to learn that some private owners of these properties are proud of them and have carefully preserved and have sympathetically modernised them. There are numerous examples in the many 'avenues' in the Mount Lawley/Inglewood suburbs. The City of Stirling (and JDAPs and the State Government) should be working to strongly favour such as these last three examples, and not to implicitly favour the ravaging or wilfully neglectful owner on his/her course to demolition. The Mount Lawley Society, and the community in general, applaud the City of Stirling for the steps it has taken to support heritage properties and values. However, we owe it to our descendants to make sure that this is the last (weatherboard) heritage property to go down into the dust. AND ANOTHER THREE BITE THE DUST !! Sadly, three houses owned by Perth College were demolished on 8th January 2016. Today the ground is littered with piles of rubble that were once classic Mount Lawley homes. Let's hope the design of their new structure changes from the very 'un-heritage-like' steel and glass structure that is proposed, to something that suits this heritage protection area. It was a great turnout for the society's Sundowner and AGM on Monday 7 December. It was wonderful to have our guest speaker, Richard Offen from Heritage Perth, give an enlightening and optimistic talk about the transformation of Perth over the last 186 year. Richard's enthusiasm for the heritage around us all is contagious and was well-received. Thank you, Richard. It was also lovely for members and guests to mingle and chat in the welcoming surroundings of the Mount Lawley Bowling Club. Committee: Christina Gustavson, Phillipa Baines, Ian Merker, Andy Ross, John Wreford, Rita Tognini, Clare Buising, Pina Caffarelli, Mark Hodge. We especially welcome our new committee members: Clare, Pina and Mark. Let's see what challenges and issues 2016 brings us. With the new committee in place, and with our members behind us, we will tackle these issues with renewed vigour. If you are at all concerned about your community and the demolition of houses in a 'so-called' Heritage Protection Area, then please contact your local State Member of Parliament and voice your concerns about this disappointing decision by the Joint Development Assessment Panel on the Perth College proposed demolition of four heritage houses in Lawley Crescent Mount Lawley. After the City of Stirling Council's unanimous decision to refuse the demolition of four heritage houses, the State Government’s North West MetroJDAP approved the demolition of four properties in Lawley Crescent last Thursday 24 September 2015. The properties are at 24, 26, 28 and 30 Lawley Crescent. All four properties are completely covered by the City of Stirling Heritage Protection Area Guidelines. That is, they were built in the protected time frame; are intact examples of their architectural style; are structurally safe and sound; and contribute significantly to an intact streetscape. Perth College has in the past been the biggest demolisher of properties in the Heritage Protection Area, and the demolition of these four is the single largest act of destruction of our built heritage. The three members who sit on the Development Application are government appointees and are not accountable to the local community. Our elected Councillors at City of Stirling [plus Councillors of all the City of Stirling Wards] had voted unanimously to oppose the demolition on Tuesday 15 September. The Mount Lawley Society has been busy in the last few weeks with various submissions - two of which we support. We fully support City of Stirling's 'Private Institution Design Guidelines' as well as substantially supporting the State Heritage Office's 2015 Heritage Bill. The State Administrative Tribunal recently rejected a seven unit development at 179 Central Avenue Inglewood stating that "if such a precedence was established it could, in time, substantially compromise the significance of the locality. This development would have been the first two-storey dwelling to directly front Central Avenue, and as such, the heritage guidelines cold not be compromised." The Mount Lawley Society applauds this decision. Our committee has been lobbying on behalf of, and providing support to, those residents who would have been living in the shadow of this proposed development. Relieved resident, Regan Whitby said "this sends a message to the residents of the area that inappropriate developments can be successfully challenged and that the Character Retention Guidelines for the area must be carefully considered by developers." The City of Stirling had previously rejected the developer's plans for this two-storey complex, which is inside the City's heritage protection zone. We seek community support to stop the demolition of 24, 26, 28 and 30 Lawley Crescent (see photos). The College plans to build a Senior Learning and Leadership Centre but we hope that with community input these classic 1920s houses can be retained. 1. The demolitions are contrary to the City of Stirling Character Protection Guidelines Policy No 3. 2. All houses were built in the 1920s and are in the Mount Lawley Heritage Protection Area. This Perth College proposal calls for complete demolition of the houses. The proposed design makes no attempt to incorporate the character features of the houses, which are evident from the street. Sadly, Perth College, in their Community Information marketing book, showed photos of their rubbish at the rear of these houses, rather than the streetscape views. The City’s Policy Guidelines state: One of the objectives of the Heritage Protection Areas is to ensure the retention of buildings in the Areas dating from the early 1900s to the 1950s where the architectural style of the building is generally intact. The MLS observes that the affected houses are generally intact. In 1974-1977 that part of Lawley Crescent suffered four heavy blows when the magnificent homes at Nos 13, 17, 19 and 23 were demolished. This left, except for the Perth College buildings, five lovely homes on the north side of the street: Nos 20, 24, 26, 28 and 30. This streetscape is all that is left of the fine and gracious part of Lawley Crescent leading up from Beaufort Street to the curve down to First Avenue. Perth College now seeks to demolish four of these properties (Nos 24, 26, 28, 30) and thus emasculate all that remains of this heart of old Mount Lawley — and this is planned in a defined Heritage Protection Area. The Society strongly deplores this major removal of heritage buildings and values. The removal of four significant homes in one blow is unprecedented in modern times. The Society strongly urges that these four properties be retained. On Friday 24 April 2015 the school conducted its annual Anzac Day Commemoration. The keynote address was delivered by Mr Arthur Leggett, OAM, ED. At 96 years of age, Arthur remains a firm favourite of the student cohort with his wit, sense of humour and generous spirit. A number of guests from the Mount Lawley Society, Rotary Clubs and present and former senior Army officers attended the service. Rotary Club of Heirisson exchange student, Charles, spoke of a former Mount Lawley resident, Eric Danker, who was killed in the Great War and buried in Charles' home village of Hazebrouck in France. This is a project between the Heirisson Club, the Mount Lawley Society and Mount Lawley Senior High School. The aim is to identify all the Anzac personnel who lived or came from the area in WWI. The Mount Lawley Society has already identified and written up on some soldiers in its newsletters. All this information is kept in the society's records and is available to those community members who are interested. Likewise, the society would like to hear more about any Anzac personnel who lived in the area and this information will be part of the joint project. Please phone 0421 545 583 or email mountlawleysociety@gmail.com to share any information you may have. Photographs over 30 years old taken in the City of Vincent which reveal life in the past. Includes: landscapes, streetscapes, buildings, interiors, people at work, groups, sport and recreation, events. A photo study of two to six photographs. This may feature: changes over time, a building interior and exterior in the same period, a house history including occupants, then and now. Entries close 6.30pm on Monday 29 June 2015. It was lovely to meet so many wonderful members of our community at last night's final Inglewood on Beaufort markets. It was a pleasure to be a part of it and we sincerely thank the Inglewood Night Market group for inviting us. 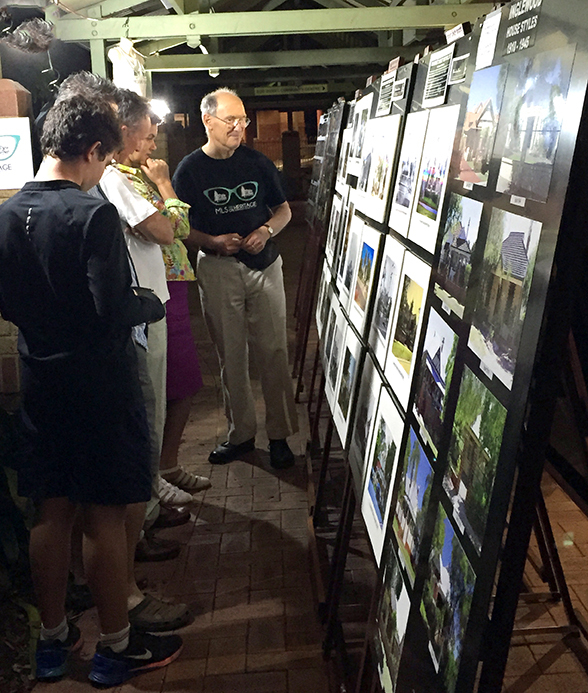 Lots of people stopped by to find out what we are about and look at our photo exhibition of Inglewood, Mount Lawley and Menora houses and streetscapes. There are a lot more photos on this website on the Photos page. If you or any resident or home owner would like to join our group, just download a membership from the Membership page. The Mount Lawley Society has submitted a response to the City of Stirling regarding the Mixed Use Development Application for 204 Walcott Street Mt Lawley (cnr Learoyd Street). The Society is not against development, but feels strongly that the heritage properties and streetscapes within the Heritage Protection Areas of Mount Lawley be protected. A combined group including Mount Lawley Senior High School students, local Rotary clubs and the Mount Lawley Society will focus on WWI service personnel during the Anzac Centenary. We are seeking information about Mt Lawley's 1914-1918 diggers, especially the fallen. In particular, we would like to talk with relatives of Staff Sgt Eric Danker, 2nd Field Ambulance, son of Frederick and Clara Danker. On Monday (2 February), there was an informal luncheon gathering attended by some of the Mount Lawley Society committee members and a few key City of Bayswater Councillors and staff followed by a bus tour of the area to highlight the aims of the Society. This was the first of many, meetings between the two groups to begin building a productive relationship so that the heritage in the suburbs of Mount Lawley, Inglewood and Menora is protected. The Mount Lawley Society had built a solid and respected relationship with City of Stirling and it is hoped that, with the Council amalgamations due to take effect, a similar relationship develops between Bayswater and the Mount Lawley Society. Those who attended were Mayor Sylvan Albert, Councillors Mike Sabatino, Martin Toldo, Chris Cornish, Director of Planning and Development Services Des Abel and CEO Francesca Lefante. Those representing the Mount Lawley Society were Pau Hurst, Barrie Baker, Ian Merker, Beth McKechnie, Sheila Robinson, Ian Hammond and Andy Ross. Thank you to Ian and Jill Merker for hosting the event. It may have been very wet with thunderstorms outside, but it was very agreeable inside! Good news on the property at 204 Walcott Street (on the corner of Walcott and Learoyd Sts). On 16th September the City of Stirling resolved that the original shopfront façade (and back to a depth of 1.4 metres) was to be retained and that no demolition of the rear property could occur until plans had been passed for the new development. Article in the Guardian Express 11 November 2014 explains the new Demolition by Neglect Amendment being brought in by the City of Stirling. To read the whole article as well as the comments by Mount Lawley Society President, Bruce Wooldridge, click here. On 22 October 2014, the State Government announced that it had accepted the Local Government Advisory Board’s recommendation that everything east of Alexander Drive will move to the City of Bayswater (”CoB”). This means that part of Menora, and all of Mount Lawley and Inglewood that currently are within the City of Stirling (Stirling’) will move to the CoB. This decision came as a massive shock, as it goes against the wishes of the community ... read more. To exclude further multiple dwellings within residential areas coded Residential R40 and below. The Mount Lawley Society supported the Amendment with a submission stating, amongst other things, that there are many R40 lots within the Avenues of Mount Lawley and that there is currently no regulation limiting the development of these blocks to multiple dwellings. To read more please download the submission below. At a meeting on 16 September 2014, the City of Stirling adopted the Amendment in a modified format. Unfortunately, it also decided that it would be "inappropriate to give significant weight to Amendment No 32 to refuse development applications for multiple dwellings until such time as the Amendment is gazetted", possibly another three or four months. To place more stringent controls on ‘Ancillary Dwelling’ within the area the subject of Schedule 9 (Restrictive Covenants) of the Scheme.